The nation of Colombia has been the victim of some bad press over the last few decades, not all of this is entirely unjustified. The 70s and 80s were not a good time for the South American nation, nor were they for much of the continent. The government of Colombia was involved in a long-simmering and occasionally boiling war with guerilla groups in the rural parts of the country. The 80s also saw the rise of international drug kingpin Pablo Escobar, who operated with something close to impunity in parts of the country. The result being that Colombia was not on the top of many traveler’s lists of places to visit, and was a rather difficult place to make a living for much of the populace as well. As a result, most Americans’ perceptions of Colombia, to this day, center around drugs and guns. This image is not necessarily helped by cultural offerings like Netflix’s Narcos or the many Hollywood movies that depict Colombia as a nation of depravity and vice. This is certainly unfair to Colombians, who are, to an individual, rightly proud of their resiliency. Proud of their nation of music and color and art. Of Gabriel Garcia Marquez and James Rodriguez and Shakira. And birds. Man, there are so many birds. Nearly 1,900 of them. And likely more once the taxonomists get through with them. For those keeping score that’s more than any other country on the earth. Colombia’s great natural diversity stems from the fact that the Andes mountains split into three distinct ranges once they reach the nation’s southern border. The three mountain ranges form a trident as they drive into Colombia. And as every armchair evolutionary biologist knows, the secret to speciation is distance plus time. Each range is a 12,000 foot fence separating the birds on the coast from the birds in the Amazon, with additional fences in between. There are a lot of opportunities for endemism both between and within the mountain ranges. Not just birds, but also plants (Colombia boasts the most orchid species, too), insects, primates, reptiles – the list goes on and on and on. Colombia’s biological riches rival even that of the nation’s most notorious criminal. So it’s appropriate then that the nation is interested in de-emphasizing the latter in favor of the former. And that’s why I was there. The nation was launching its official National Birdwatching Strategy, which is a pretty cool thing for a nation to have, let alone one that can offer so much to that end. 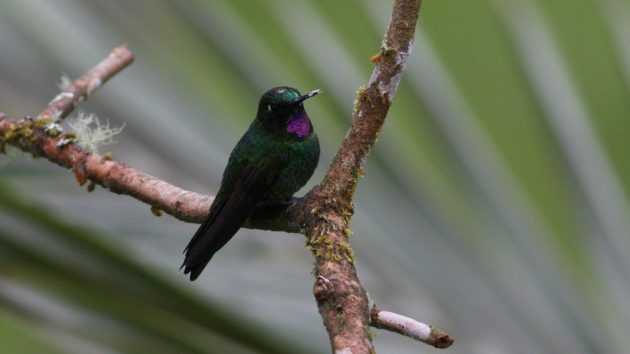 Colombia wants to go big into the birding travel industry, with appropriate government backing of bird lodges and guides and the infrastructure needed to get people from the US and Canada and Europe right in front of some of the most incredible birds in the tropics. Though I was only there to go birding for two days, I saw a lot. Many wonderful birds and several wonderful places. I’ll share a few of them here. 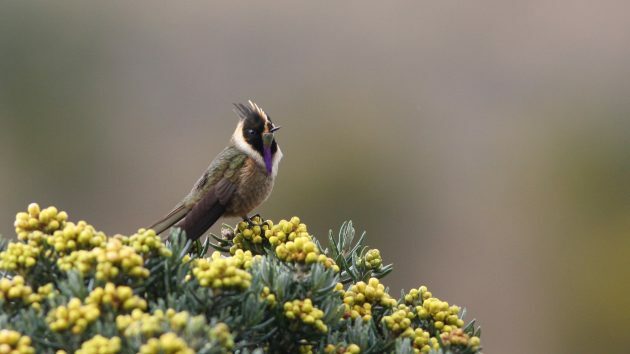 Buffy Helmetcrest is a Colombia endemic, its range only a speck on the slopes of the Central Andes in the vicinity of Nevados Ruiz, a 14,000 ft tall active volcano in the Central Andes. This little hummingbird lives in an amazing montane, elfin forest habitat above 12,000 feet, where it feeds on small flowers among snow flurries and biting wind. Cauca Guan was thought to be extinct. In fact, the field guide that many birders bring to the country, an older book by Steve Hilty, lists it as likely extinct. 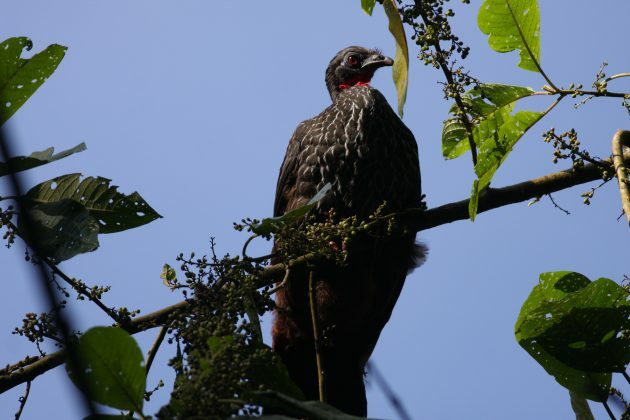 Even though numbers are still low, they are known to be found in the forests of Otun Quimbaya near Manizales. Previously this area was held by FARC guerillas and birders were unable to visit. Now we can, and the guans are not hard to find. Mountain tanagers are among the most spectacular birds on the planet – velvety black with bright splashes of color. This Blue-winged Mountain Tanager was visiting the feeders at Rio Blanco with its chick. Antpittas are notorious for being among the most difficult to find birds in the neotropics. But at Rio Blanco, a resident has trained them to come in to his voice and eat earthworms. It’s an incredible experience to see these cotton balls on stilts as they hop out from the dense mountain forest underbrush and dance around in front of you. 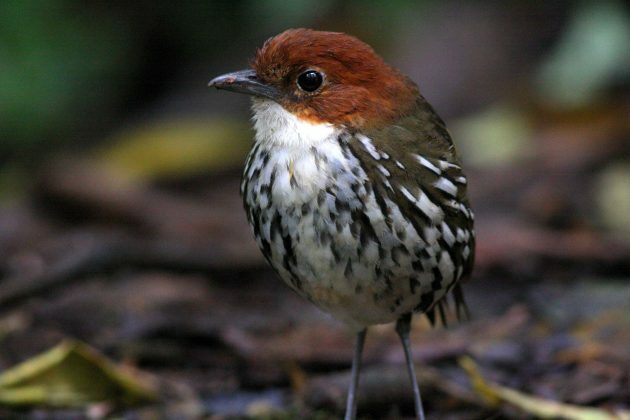 This Chestnut-crowned Antpitta was one of four species we’d see this way. It looks something like this. I tried to get one to come to me, but I didn’t have the touch. 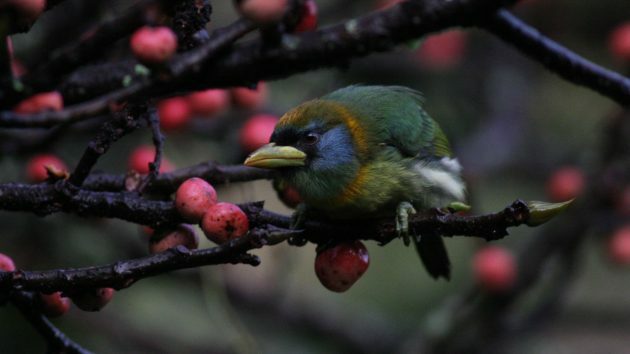 Barbets are always cool, and this female Scarlet-headed Barbet put on a show in this fruiting ficus tree. In fact, this tree was among the most productive spots on the entire trip, as the feeding flock it contained featured Bay-headed Tanager, Crimson-rumped Toucanet, Golden Tanager, and Red-ruffed Fruitcrow, among others. Our final stop was at Termales del Ruiz, a small hotel at the foot of Nevados Ruiz, which featured a swimming pool sized hot tub filled with water warmed from the volcanic hot springs nearby. The cold air and the warm water filled the air with fog, giving the place an otherworldly atmosphere. It was if I’d stepped into Rivendell in Middle Earth. Here the hummingbirds were exceptionally friendly, and here I got to experience what we called the “Beso del colobrí”. If you ever wanted to get up close and personal with a hummingbird, as I did with this Great Sapphirewing (the 2nd largest hummingbird in the world), you cannot miss it. It was an incredible experience to see Colombia as it is, not how it is so often portrayed. The people are friendly, the nation is modern, and the birding is superb. In 2 days of birding we had nearly 170 species, including a great many Colombian endemics. I wish I could have stayed longer and seen more. Next time, I suppose. 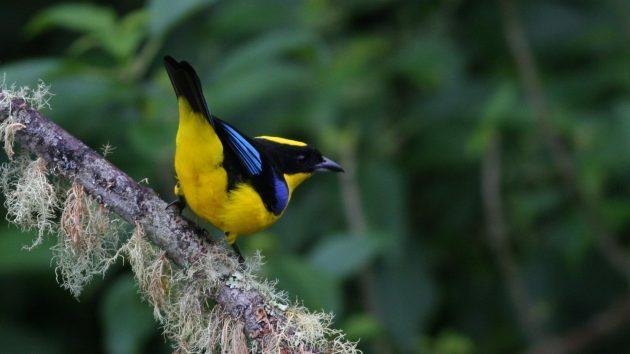 Colombia has opened its arms to the world, and the world’s birders. Who are any of us to refuse it? Wow, you do get around this year, ey? Amazing experience. Sadly, Colombia also has a bad reputation here in Germany, but since it has gotten out of the news it is slowly improving. Where Are You Birding this Third Weekend of February 2009?